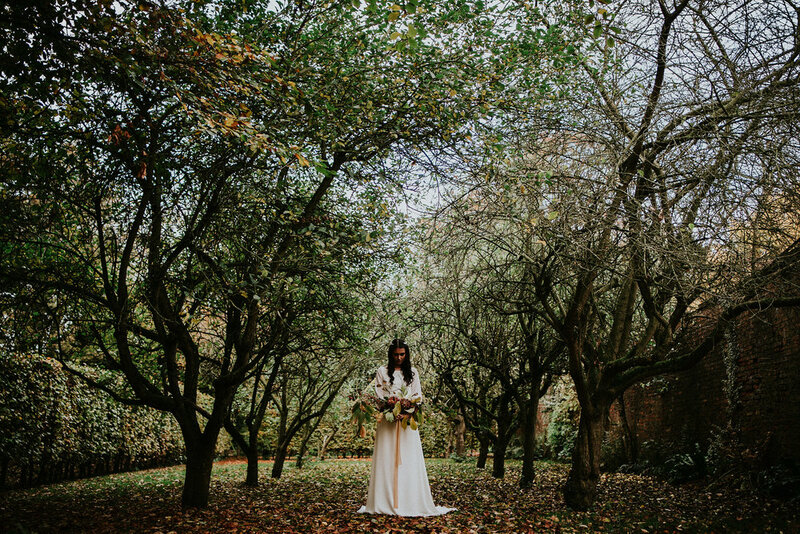 I am so honoured to have been asked to provide the florals for this shoot that came about to launch the new range of bespoke and vintage-inspired dresses from Glory Days Bridal, which happens today! AND (small fanfare ...) Hayley is giving away a wedding dress to one very lucky winner, completely free of charge - see the bottom of this post for details - heck that's one great offer! Hayley got the team together to showcase her gorgeous new range and everything just came together like magic. Saltmarshe Hall was an incredible venue with amazing grounds and outbuildings. It was a heavenly day! I made three bouquets in total, these two I made in advance from my gardens and the other was foraged entirely from the grounds (with a couple of added chrysanthemum heads for added 'umph') and made on the spot , it was all wild, unruly, big and gangly! The second bouquet was more restrained and in cooler tones of lemon, pale pink and cream flowers from my garden, including lemon sunflowers, garden roses, lemon dahlias that fade to pink, pink scabious, ferns, jasmine and sweet pea trails. As well as a single faded lacecap hydrangea head and, unbelievably for November, a small white foxglove. The third, again all picked from the garden with the exception of the trailing pepper berries, was in deeper tones of rusts, salmons and pinks. Again, a little more restrained thank the foraged bouquet, with large dahlia and chrysanthemum heads taking centre stage, but with some twirling flourishes of sweet pea vines and jasmine trails. I also designed a flower crown from the foraged goodies, with a bit of chrysanthemum added for good measure. It was wonderful to be part of such an amazing team of people (including the hairdresser who worked with a broken arm, without realising it was broken!!) and I suspect there may be more (shoots! Not broken arms ).....??? And for that chance to win the wedding dress see the feature on Rock My Wedding today - you have until midnight on 28th January 2017. Good luck!!! Yesterday I was involved in the most glorious of shoots and as I type there are only a few preview images from the amazing Shutter Go Click Photography but they are so beautiful I couldn't wait to share them! The shoot, at Saltmarshe Hall, was arranged by Hayley from Glory Days Vintage Bridal for the launch of her amazing new range of hand made dresses, which she only finished the night before and oh my word, were they exquisite! The lovely people at this beautiful venue (I really hope I get the chance to work there again, it was SOOOO up my street!) allowed me to use foliages and berries from the grounds to make this bouquet and oh boy, was I in my element. SO many beautiful buildings, walls, trees (and even drainpipes!!). It was a collaboration with, amongst others, my two lovely friends James and Jo Melia of Melia Melia Photography (see below for full details of everyone involved) and the images we achieved are some of my all time favourites. It was the first styled shoot at The Arches, Dean Clough in Halifax, West Yorkshire UK, from which they launched as a wedding venue. It is fabulously different, it's industrial setting allows for something that little bit different and away from the mainstream wedding 'look', all of which is right up my street! For this collaboration we wanted to embrace the heritage and grittiness of the building itself, I used flowers to pick up the colour of the brickwork, grey silk ribbons that echoed the stone flag flooring and the steel girders, we even used items from the fabulous antique shop around the corner, most of which were from the mill itself. I created an arch from a piece of rope and a branch, built a fireplace from crates and a charred old plank, we filled a filing system with flowers and used two beautiful salvaged wooden benches for the ceremony. The table plan was foliage circlets hanging from holes I could find in the beautiful stone wall (now sadly no longer there). The flowers were large and unapologetic, this was a chance to do something that I would naturally do, given a free reign and an open brief, a dream come true in fact! The food from Eat Me Drink Me was amazing too, we know as we got to taste it at lunchtime!! It is as good as it looks, proper "Yorkshire Fare' !